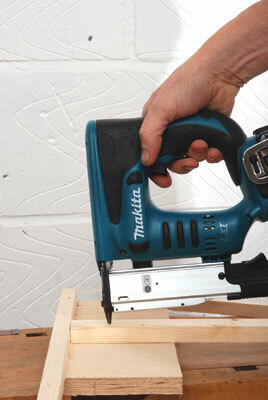 The new range of 'Slightly Different Makita Blue' Li-Ion tools seems to be very desirable. With the new colour comes a new emphasis on performance and handling. This pin nailer joins the stable with the professional user very much in mind and a long history of fine Makita quality to uphold. 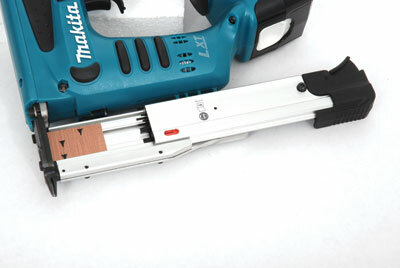 Some cordless nailers have suffered with weight and bulk because they need a fair bit of oomph to fire the nails, but Lithium-ion technology is both weight saving and powerful and is used to full advantage on this Makita. The pins are thinner than usual. Being headless they are ideal for glazing, but seem not to be so robust. Slight ridges act a bit like the rings on annular nails, making for a stronger friction hold. Even when firing the longest 35mm pins into MDF and ply, the Makita performed faultlessly, with no need for extra pressure on the head of the nailer with my left hand. The tool action is smooth and quiet, the recoil is gentle and the pin is fired flush every time. Even on some hard oak only a little more firmness was required. I was a little disconcerted to find that once the safety trigger lever is pulled back the nailer will fire, even if it is above the surface of the work. You have to watch out that there are no stray fingers about! 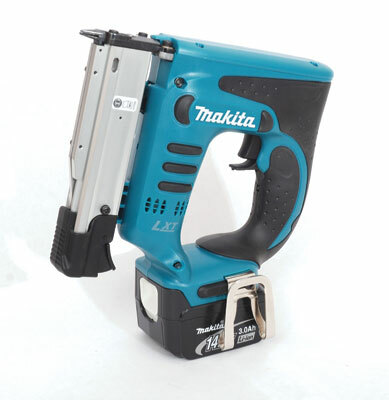 Bearing in mind its compact size and low weight, this little nailer seems like it could be a good tool for shopfitters, kitchen fitters and glaziers. Amateur users would like it too, but might baulk at the price. "This little nailer seems like it could be a good tool for shopfitters, kitchen fitters and glaziers"